What on Earth Does “Door Overlay” Mean? In the language of cabinet design, what on earth does “door overlay” mean? When speaking with a designer about renovating your kitchen, have you been asked about your preference for “door overlay”? While you are quite familiar with the current cabinets you use daily, most homeowners would just shrug their shoulders at this question. Yet it’s an important consideration when planning your new kitchen. We’re here to educate you on the available products and their construction so that you can make informed decisions. 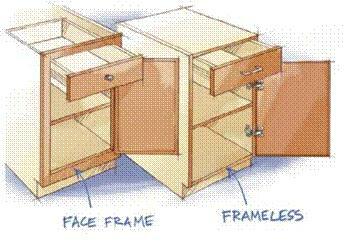 Framed = Full or Partial, the cabinet box face is seen around the cabinet door and drawer. This is a traditional cabinet style. Inset = the cabinet door and drawer face are set into the cabinet box. This is a traditional furniture style. Frameless = the cabinet box is not “framed” on the front, and only the cabinet door and drawer face are seen. This is a modern, European style. Framed cabinets have a ¾ inch hardwood frame that is attached to the sides, top and bottom and overhangs each side ¼ inch. The door sets on top of the frame. A full overlay is a larger door that leaves a small amount of face frame to be viewed. A partial overlay means that the door is smaller, revealing more of the frame. If you can stick two or more of your fingers between the doors, you have a partial overlay cabinet. Inset cabinets are a framed cabinet that has the door inset into the frame. This provides a look more like furniture. However, changes in humidity will have an effect on the functioning of doors and drawers. In New England, humidity levels change with the seasons. Because the door is set into the frame, it can stick during summer when the wood swells in high humidity. When humidity decreases in winter, you can see spaces around the doors as the wood contracts. You will not see these problems if you control the humidity at around 50 percent year-round with the use of air-conditioning in summer and humidifiers in winter. Frameless cabinets are essentially a box with finished front edges but no face frame. The door and drawer front completely cover the box front. This allows wider drawers and gives you full access to your cabinets with no “lip” in the way as you move items in and out. For answers to any more of your cabinet or design questions, please call us at Kitchen Views 508.DESIGNS [337.4467].